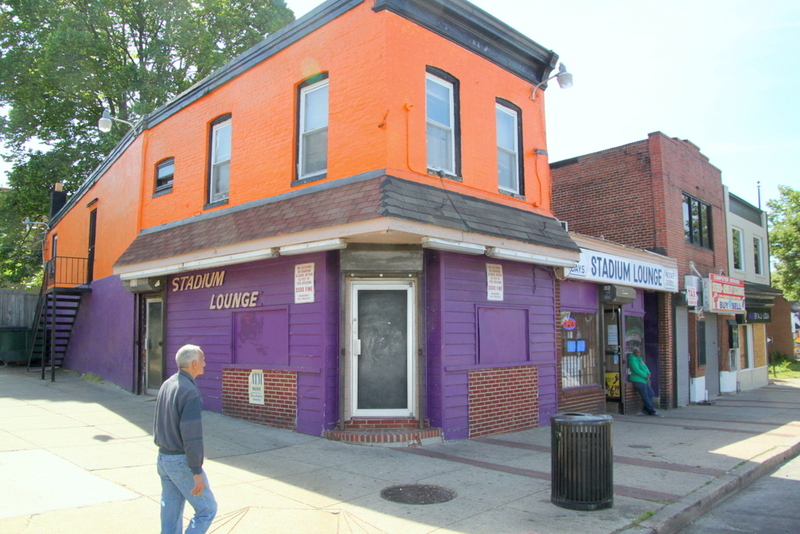 Above: Stadium Lounge got its name back in the days when the Orioles played at Memorial Stadium on nearby 33rd St.
Found in violation by the Liquor Board for making illegal payouts on video slot machines, the Stadium Lounge at 3351-55 Greenmount Avenue received a stiff penalty today – a six month suspension and a $9,000 fine. They might have come away with a lesser four-month suspension, the penalty that chairman Thomas Ward had initially suggested. But commissioners Dana Petersen Moore and Harvey E. Jones upped it to six months. Moore explained why she thought licensee Domingo Kim deserved the harsher penalty. According to the charges before the board, officers from the Baltimore Police Department had raided the Waverly establishment on March 12 and found five illegal video slot machines and witnessed at least two patrons receiving payouts for gambling on the machines. From a bank bag and other places on the premises, the officer seized $7,867 in cash. “That says to me you know exactly what you’re doing,” Moore said, looking hard at Kim, as he stood in the City Hall hearing room with his attorney Frank Boozer. Severe as it was, the penalty was still not what the half-dozen residents who testified today against the tavern wanted – revoking the license that owner Kim has held for the last eight years. An additional 20 people in the audience stood up and said they were also in support of killing the license. Speakers calling for revocation included 14th District Councilwoman Mary Pat Clarke and representatives of the Waverly Improvement Association, Guilford Association, Waverly Main Street, Greater Homewood Community Corporation and others. Nearby residents gave vivid testimony of what they say it is like at 6 a.m., when the Stadium Lounge opens and begins selling cheap liquor to customers. “You see guys staggering around the alley drinking beer out of paper bags, peeing in the alley, when I’m standing right there with my kids,” said longtime Oakenshawe community leader Mark Counselman. Counselman and others described years of complaints to police and the liquor board, and a verbal agreement with Kim that he would clean up trash around the establishment, not sell miniature-sized bottles of liquor and maintain better communication with community associations. Former Waverly Improvement Association president Regina Boyce said that in the years since Kim took over the business, relations with him deteriorated and the establishment became less safe. At first, Boyce said, she used to be able to walk into the business to drop off fliers or talk to Kim. Sonia Merchant-Jones, who chairs the Better Waverly Organization, said she has lived in Waverly for over 50 years and has good memories of walking on Greenmount Avenue in better times. He noted that in 2008 the liquor board had fined the establishment $3,000 and suspended its license for five days. In 2013, the bar was fined $625. “We issue fines, but it doesn’t do any good,” Jones said. Attorney Boozer had initially asked the board to postpone the hearing, noting both that his client also has criminal charges pending and acknowledges that he’s guilty of the three liquor charges. Ward accepted the “admission” of guilt that Boozer said he had worked out with the board’s deputy executive secretary, Thomas Akras, beforehand. But Ward denied his request for a postponement and allowed the witnesses in the room to speak, not on the gambling charges but on their general complaints about the establishment. Boozer objected to non-gambling-related testimony, but again was overruled by Ward. But the board ultimately did not grant the residents’ request that it kill the lounge’s license outright. Noting that the charges before the board were specifically about illegal gambling, Ward said it was not appropriate to take action on the other complaints. “To revoke the license, it’s the wrong time,” he observed. But he added that the lounge could be dealt with harshly in the future after it completes its suspension.